The Oppo Reno global launch date has been confirmed by the company. The phone, which will be the first in the new series, is set to make its official debut in China on Wednesday. But it appears the rest of the World won’t have to wait too long for the phone. The phone boasts a Qualcomm Snapdragon 855 processor under the hood, and will have a 3.5mm headphone jack, as well as a USB Type-C port. The Reno is equipped with a 48MP camera which is said to support 10x optical zoom. We have seen some leaked renders of the phone which reveal the full design of the device, including a notch-less display and a rather unusual wedged shaped pop-up selfie camera. According to an Oppo Reno AnTuTu Benchmark and a TENAA listing, there will be a mid-range variant of the phone. The device will be powered by a Qualcomm Snapdragon 710 chipset, and will sport a less powerful camera, with a 16MP lens. The flagship variant of the phone will be available in 4 colours: Nebula Purple, Pink, Sea Green and Midnight Black. 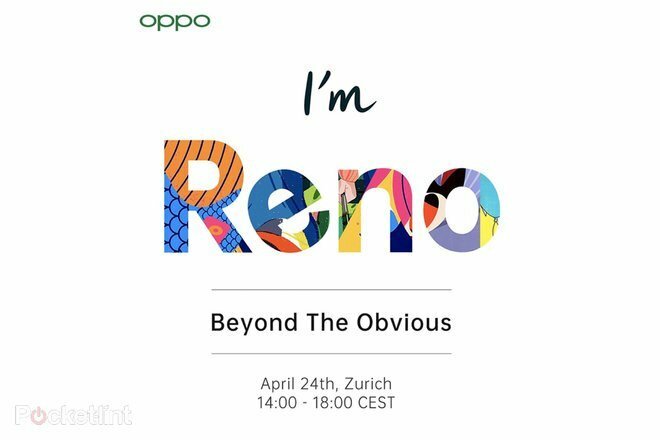 According to Pocket-Lint which got the press invite from the company, the Oppo Reno global launch date has been set for April 24th. The event will be held in Zurich, Switzerland.